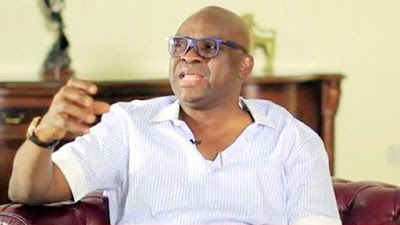 The Ekiti State Governor, Ayodele Fayose, has claimed that the Edo governorship election was between the Peoples Democratic Party, PDP, and its candidate, Pastor Osagie Ize-Iyamu and the Independent National Electoral Commission, INEC, not the All Progressives Congress, APC. INEC had on Thursday declared APC’s candidate in the election, Godwin Obaseki as winner of the keenly-contested governorship election in the state. But speaking through his media aide, Lere Olayinka, Fayose lamented that the win-at-all-costs attitude of the APC was inimical to the sustenance of democracy in the country. The governor alleged that rather than allow the people of Edo State elect their leader, APC conspired with INEC to impose Obaseki on the people. According to the governor, it was unfortunate that those, whose emergence was made possible because the then PDP government allowed the people the freedom to make a choice, have now eroded the independence of INEC. He said, “The stage for the manipulation of the election was set by the use of security agencies to postpone the election, even when there was no single security threat and what was witnessed in Edo State last Wednesday was the execution of the rigging plans perfected after the postponement. “The power of the people to choose their governor was completely robbed at gunpoint in Edo State. Unfortunately too, these elements have even murdered the rights of Nigerians to protest against the subversion of their will and it is now obvious that only the insistence of Nigerians can save democracy in the country.